One of the most significant applications of light therapy is in the treatment of¬†Seasonal Affective Disorders (SAD). There is a large body of scientific evidence that points to the efficacy of light therapy for the treatment of SAD. What is not quite understood, yet, is how light treatment works. We have shown that our daily rhythms are affected by the availability of the natural sun light. Many of us work in artificially lit buildings and does not get enough light. Most artificial lighting cannot replace the natural light. The reason for this is that the type of indoor lighting we use is not of sufficient intensity to affect the hormonal mechanisms which control our bodily rhythms. Intensity of light is measured in a unit called lux. One lumen means the light received by the receptor at an intensity of one lumen per square meter. Thus the intensity of light at any point is determined not only by the strength of the illumination source but also by how far it is from the source. The electric light used in most homes and workplaces rarely exceeds 500 lux. A sunny afternoon could be as much as 100,000 lux, and even the cloudiest day is rarely below 10,000 lux. Researchers have discovered that light of at least 2,500 lux is necessary to suppress melatonin production in humans. Most of the bright light therapy uses 5000 lux light (10,000 lux preferred.) The artificial light we use indoors is not of sufficient intensity to suppress melatonin and to correct the circadian rhythm. Night-shift workers, and people who live in Arctic climates, are usually exposed to light levels of only 50 lux. Light specialists believe this “mal-illumination” may be at the heart of many common disorders, including fatigue, depression, skin damage, suppressed immune function, and, of course, sleep problems. Light therapy for¬†Seasonal Affective Disorders and circadian-rhythm disorders involves sending visible light through the eyes so that it reaches, and triggers, the pineal gland. There are several different types of light therapy in use today; the oldest is sunlight itself. The sun is the ultimate source of full-spectrum light, which means it contains all possible wavelengths of light, from infrared to ultraviolet. Generally speaking light therapy involves the use of equipment that sheds either full spectrum or bright white light. Typically, the aim of sunshine remedy is to extend the amount of sunshine to which we would in any other case be exposed. 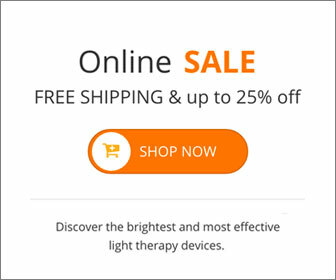 Bright light therapy consists of looking at special broad spectrum bright lights from one-half to three hours a day, generally in the early morning hours. One should not stare directly into the lights because of possible eye damage. A substantial amount of light is needed, which implies the distance from the lights to your eyes needs to be monitored—close enough to give you the best amount of light, but distant enough so you don’t hurt your eyes. By the mid- 1980s, bright-light therapy (phototherapy) had become the treatment of choice for SAD. However many individuals found it difficult to allocate the four hours everyday for the light therapy. Further research was conducted by the researchers to determine an optimum light therapy. It was found that similar benefits can be obtained from a morning only therapy, effectively slashing the time by half. Later, by increasing the brightness or the intensity of the lights used, the therapy time was cut down further. SAD symptoms typically begin to lift about a week after the start of phototherapy. But they return shortly after discontinuing the treatment. As a result, authorities urge people to sit under bright SAD light therapy lamps daily from October through April. This entry was posted on Wednesday, April 28th, 2010 at 12:59 pm	and is filed under Light Therapy, SAD. You can follow any responses to this entry through the RSS 2.0 feed.